Image Size 10 x 5 in. Leslie Putnam is a London Ontario based artist who’s practice works to engage a wider audience through multi-sensory experiences. 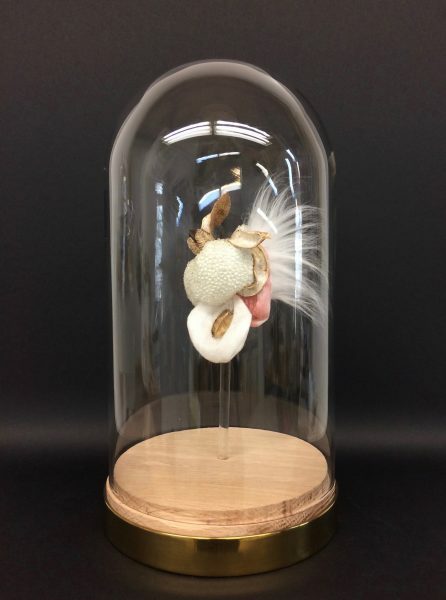 Working mostly with natural materials, producing both 2d and 3d works, her pieces use such diverse materials as beeswax, felt, found natural materials and audio components. Connections with her audience to the contemplation of their interactions with the natural world are her primary concern. Encouraging a dialogue between the audience, herself and the work, Putnam creates an ongoing practice that develops relationships to, and underscores our understanding of what it means to be human in a non-hierarchical context. This piece is part of a series that I had been working on from 2016-2018. Based on antique botanical images, I worked forward, imagining the shape contemporary images of a similar bent would take. It was necessary to include plastic in the work in order to address the ever-growing problem of plastic in our environment.